Three Options: 5.25 mile loop around Reservoir; 4 mile Boulder Valley Ranch Loop; 9.9 mile combined run. Supplying 20% of Boulder’s drinking water, the Boulder Reservoir is one of the city’s most popular running and cycling destinations. Offering volleyball courts, boat rentals, restrooms, showers, a seasonal swimming beach, several picnic tables, and horseshoe pits, the Boulder Reservoir typically fills by June, and draws down in September. 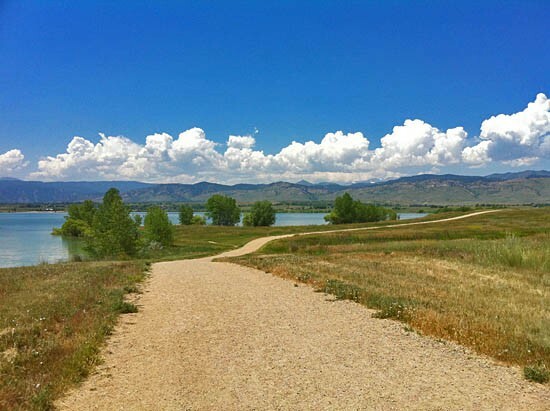 The 700-acre multi-use recreation area is a 5.25 mile loop around the reservoir, on mostly graded dirt, with water and mountain views the whole way. Note this trail does have one steep hill. The flatter Boulder Valley Ranch Loop is an approximately 4-mile run, and can be done standalone or combined with the Reservoir loop. Used for walking, running, cycling, horseback riding, and mountain biking, the Ranch is accessible year-round. Enjoy the beautiful scenery, tranquil atmosphere, wildlife, and dozens of rare butterflies. Also take note that this loop is both dog and kid friendly. Boulder Reservoir entrance on 63rd. St. just south of Monarch Rd. & west of Rt. 119; Boulder Valley Ranch Loop trailhead off Longhorn Rd.